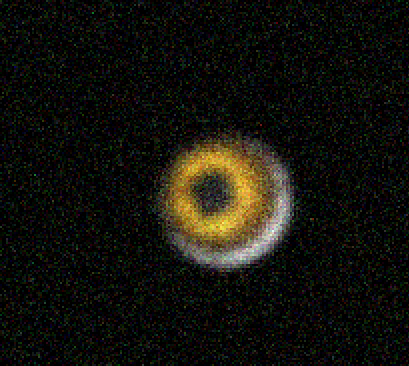 SCP-1094-EX, as seen during the 1094-1 satellite mission (circa 2███). Click to enlarge. Special Containment Procedures: Unless directed otherwise by SCP-1094-EX's head researcher (Dr. ████), the Foundation is to continue monitoring SCP-1094-EX for anomalous activity. A request to inform NASA of FT-2935-B's findings is currently pending approval by the O5 Council (See Addendum 3). Description: SCP-1094-EX refers to a planet in the E-56834 system located 104 light-years from Earth. SCP-1094-EX has a radius of 8,642 km and a mass of 22.3 M⊕1. The majority of SCP-1094-EX's surface is composed of white fine-grained granite and several mountainous regions, suggesting previous volcanic activity and erosion. 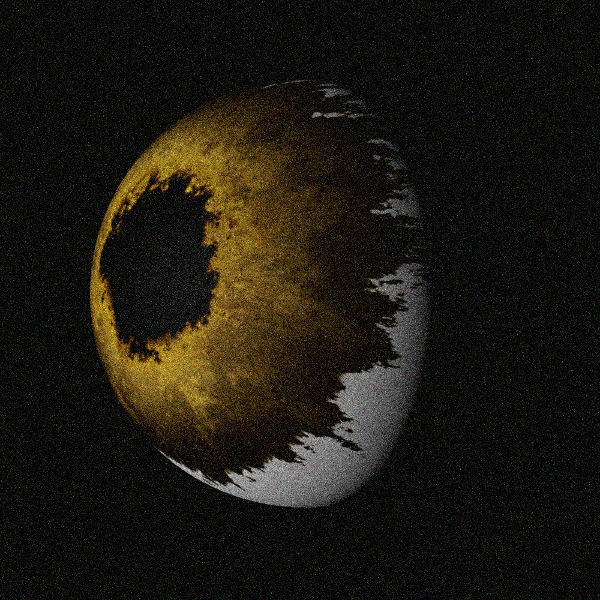 SCP-1094-EX has an appearance similar to that of a human eyeball due to a large impact crater on its surface, presumably caused by collision with another exoplanet in its solar system. The dark central circle of the impact area is composed primarily of ash, graphite and other debris, while the surrounding yellow ring is composed of sulfur and iron oxide. The composition of SCP-1094-EX below its crust is currently unknown. First photograph of SCP-1094-EX (circa 1999). Click to enlarge. Addendum 1: SCP-1094-EX was discovered during routine observation of celestial bodies in the outer Milky Way Galaxy on 10/09/1999. As there was no other information on it at the time of discovery, SCP-1094-EX was given a placeholder designation as an anomalous object2 until further analysis of the object could be done. Addendum 2: On 01/04/2002, Foundation probe FT-2935 was launched from Area-███ on a set course for SCP-1094-EX. FT-2935 is estimated to intersect with SCP-1094-EX in approximately ███ years See Addendum 3 for more details. Addendum 3: On 12/10/2███, FT-2935 landed on SCP-1094-EX, having split into two different compartments (FT-2935-A and FT-2935-B) before landing. FT-2935-A was set to land on a portion of SCP-1094-EX's bare surface, while FT-2935-B was set to land on SCP-1094-EX's yellow ring. After conducting several tests on its surface, F-2935 deemed SCP-1094-EX non-anomalous. During analysis of SCP-1094-EX's surface materials, FT-2935-B detected large amounts of deceased, extraterrestrial organic matter. FT-2935-A did not detect anything of similar value.